It seems the ink from the pen of the editor of the Sierra Leone Telegraph had hardly dried, after publishing an article yesterday, predicting that the ruling APC will be passing a resolution at their convention, which will allow president Koroma (Photo: President Koroma after winning the 2007 elections) to stay in power for a third term, only to read in Cocorioko today, that this indeed is likely to be the case. In our article published yesterday in the Sierra Leone Telegraph, titled: ‘Congo decides on presidential third term – lessons for Sierra Leone?’, we said: “Skeptics in Sierra Leone believe that president Koroma too, is planning to orchestrate a national referendum next year, which could result in sweeping changes to the country’s constitution, especially the presidential term limit clause. “President Koroma is currently serving his second term in office, after winning the 2012 elections. “But the constitution as it stands, will exclude Koroma from contesting again in 2018, although he has on several occasions said publicly that he is not interested in running for office for a third term. Not many people in Sierra Leone believe the president. “Next year, the ruling APC party will be holding its convention, when it will elect a new party leader and presidential candidate for the 2018 elections. “There is every reason to conclude that the contest for the APC party leadership would be fierce, and could split the party. And should this be the case, the majority of rank and file members may well demand a vote at next year’s convention, for president Koroma to stay on and contest the 2018 presidential election. “In the likelihood of the majority of Sierra Leoneans voting YES for a third term presidency at the national referendum also taking place next year, Will president Koroma swallow his own bait – hook, line and sinker? “Will he accept an invitation from his party rank and file to contest a third term – risking the possibility of widespread political violence and chaos in the country, or will he bow out gracefully? Well, if the outcome of the APC Youth League Convention which took place in Makeni yesterday is anything to go by, then it seems president Koroma’s master plan for a third term in office has inched one step closer to reality, as phase one of the battle to lead the ruling APC party is successfully concluded. The meeting was chaired by president Koroma himself. The APC Youth League is perhaps the most powerful caucus or single power block in the party. Its Makeni resolution was loud and clear. (Photo: APC Youth League Convention yesterday Sunday 25th October 2015. Courtesy of Cocorioko News). Members of the Youth League have called for president Koroma to continue in office as leader and chairman of the party into 2018 and thereafter. Parliamentary and presidential elections will be held in Sierra Leone in 2018. 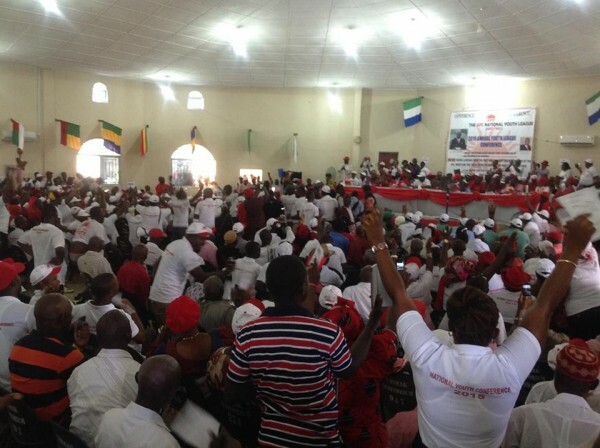 According to the government sponsored Cocorioko Newspaper article titled: ‘More Time…Ernest Koroma To Continue As National Chairman And Leader’; “Youth leaders of the All Peoples Congress have in their messages of felicitation at the just concluded annual conference of the APC National Youth League, intensify their calls for more time to be given to President Dr. Ernest Bai Koroma to continue as National Chairman and Leader of the All Peoples Congress to ensure the party remains united and fit to continue in governance after the 2018 elections. Echoing the voices of the hundreds of APC youths who gathered in Makeni yesterday, the president of the APC National Youth League – Bai Mahmoud Bangura, appealed to delegates to consider giving more time to President Koroma. The Sierra Leone Telegraph has been quite clear and consistent in its analysis of president Koroma’s grand desire and master plan to stay in office for another term. And this resolution of the APC Youth League, unanimously passed in Makeni yesterday by the most powerful single group of the party, is a clear manifestation of the road map which the president has cleverly orchestrated to fulfill his third term ambition. Supporters of the president would argue that the president has no intention of pursuing a third term political ambition, as he has on a couple of occasions said publicly that he does not want to stay beyond the constitutionally mandated two terms. But it is becoming quite obvious that this is just a presidential smokescreen aimed at snuffing out those within the ruling party that are harbouring presidential ambitions. By cleverly using his cousin John Sisay who is the chief executive of the country’s mining company – Sierra Rutile as a political stocking horse for the leadership, not a single senior party grandee with potential to lead the party, has come out publicly to declare their intention to run for the presidential office when the party holds its national convention in 2016. The former vice president Sam Sumana, who not only fancied his chances of running for the leadership, but had started to position himself publicly, was cruelly thrown under the bus by the ruling APC party executives. This decision by the ruling party grandees paved the way for president Koroma to stick the knife in, rather than show the vice president any mercy or compassion. Although the Supreme Court ruled that president Koroma had done nothing wrong by unilaterally sacking vice president Sam Sumana without recourse to parliament as required by the country’s constitution, most people in Sierra Leone believe otherwise. 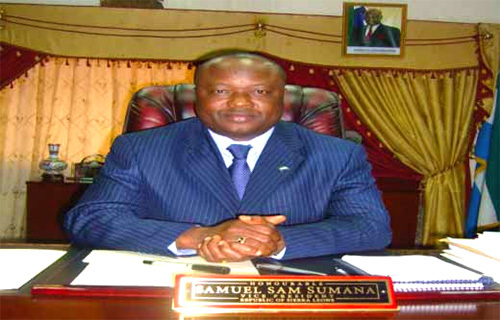 The sacking of vice president Sam Sumana is seen by many as a strategy by president Koroma to clear the field wide open for the leadership contest next year, in which there will now be only one candidate for the presidency in the camp – himself. As phase one of the battle to lead the ruling APC party was concluded yesterday in Makeni, there is though the possibility that president Koroma may not have it all his own way. 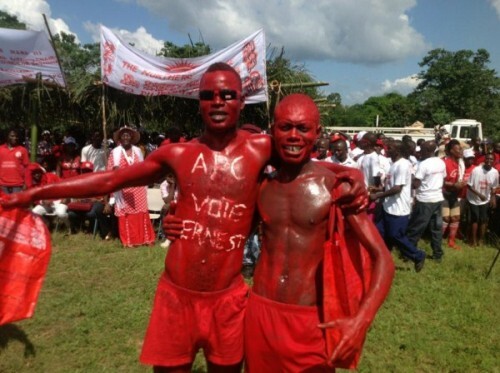 There could be blood on the Red carpet at the APC national convention next year, when the resolution by the Youth League, calling for president Koroma to stay on as the party’s leader and chairman is tabled. But it is also likely the party could avert an all out war, if president Koroma chooses to ‘man-up’ and reject calls for his nomination as the party’s presidential candidate for the 2018 elections. This may well require changes to the party’s constitution, so as to clearly separate the role of party chairman and leader, from that of the presidency or presidential candidacy. 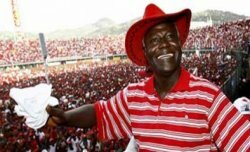 Should this constitutional change or clarification be endorsed by the national party delegates, president Koroma may well stay on as demanded by the youths as the APC party leader and chairman, responsible for overseeing the party’s presidential candidacy election next year, but himself not contesting that election. Can APC avert an internecine all-out war next year? That depends on whether president Koroma interprets the resolution passed by the APC youths in Makeni yesterday, as a clarion call for him to stay on not only as leader and chairman of the ruling APC party, but to contest the presidential election in 2018. Congo decides on presidential third term – Lessons for Sierra Leone? Let us try to practice matured Democracy in Sierra Leone, gone are the days when politicians used to terrorize others for their own political ambition. Same old APC at it again. Our country will never see pure governance if we don’t stand up and change the political landscape of our nation. This staying in power ambition is never going to happen. The people of Sierra Leone have emerged from the nefarious attitude of this government. I only hope it does not result in another catastrophe. But we must stand up and hold our ground. We do not want to be left behind other progressive nations. This masterstroke has all the hallmarks of former president Siaka Stevens written all over it. It is the kind of political tricks Siaka Stevens himself would have pulled off like a rabbit from a magician’s hat. And right now there is no one that can stand up to Ernest Koroma in the APC. The man is so powerful that he has even bought the man that wants to lead the opposition SLPP and become president, Brigadier Maada Bio. With the help of Maada Bio’s greed and desperation for power, president Koroma is being allowed to once again dictate and impose his will on our people. What the APC youths are saying clearly is that there is no one in the party that they can trust who is capable of leading the party and the nation. This is a very sad day for democracy in salone and a great concern for the peace and stability of a country that is still broken by the war. As I like to read news about my motherland, I can recall the APC Convention in 2013 when members of the party unanimously agreed for President Koroma to continue as Leader of the party after his second term as President. In view of that my understanding was for President Koroma to continue his leadership of the Party and not Sierra Leone The constitution of any Party is different from the constitution of Sierra Leone. You will agree with me that if President Koroma gives way in the APC Party, they will find it difficult to win any election in the country as for now. APC knows exactly what they are doing. They want to use President Koroma to win the next election before they will reverse the wheel to their direction. Psychologically they are focusing on winning, rather than choosing a new leader of their party. They are focusing on winning the next election with the weight of President Koroma. Let us forget about third term in office. To my understanding the SLPP constitution doesn’t allow a losing Presidential candidate to re-run as a Presidential candidate for the Party, but Maada Bio is running again as a flagbearer for the Party, because some People believe in him. I will never critise anyone for believing that his or her candidate can win an election. But I am not convinced about the need for third term presidency in Sierra Leone.